Rex Maggert, of West Milton, portrays Marion S. Hoover. He will present a program Tuesday, April 9, in the Amos Memorial Public Library. SIDNEY — The Shelby County Genealogical Society will present a performance by West Milton historian Rex Maggert, “The Life and Times of Marion S. Hoover,” Tuesday, April 9, at 7:15 p.m., in the Amos Memorial Public Library, 230 E. North St.
Maggert is a local historian who has been doing family research for more than 20 years. 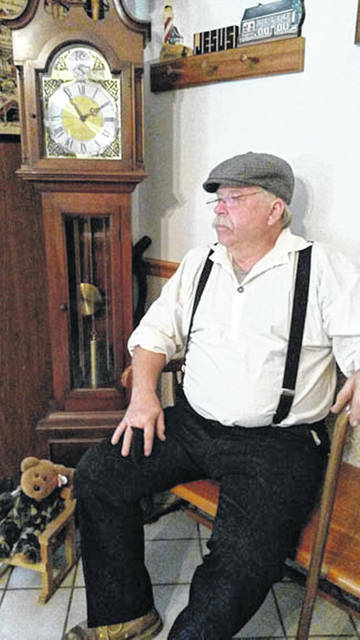 A member of the Stillwater Civil War Roundtable, he will portray Hoover and discuss how life changed from the 1870s to the 1960s, the time period in which Hoover lived.